This oil sketch records an unhappy incident in Hogarth’s life. His friend George Vertue claimed that when he heard of the forthcoming marriage of Princess Anne and Prince William of Orange he ‘made an application to some Lady about the Queen that he might leave to make a draught of the ceremony & chapel & paint it & make a print of it for the public’. The Queen granted permission but when he came to make the sketches he was driven off by his rival artist, William Kent, who enjoyed the favour of the Queen and was anxious to preserve the monopoly status of his own image. To add insult to injury, Hogarth had some time earlier ‘begun a picture of all the Royal family in one peice by order the Sketch being made.& the P. William the Duke had sat to him for one. This also has been stopt.’ It is for this reason that this sketch and the smaller variant in the National Gallery of Ireland are all that survive of this project. We should treat Vertue’s phrase ‘by order’ with some suspicion: it is surely likely that this was a commission actively sought by the artist, perhaps with a view to creating a profitable print. This would explain the existence of the work under discussion, presumably a full-sized oil sketch, presented to the King (or his agent) for his approval, a process seldom required with commissioned conversation pieces. 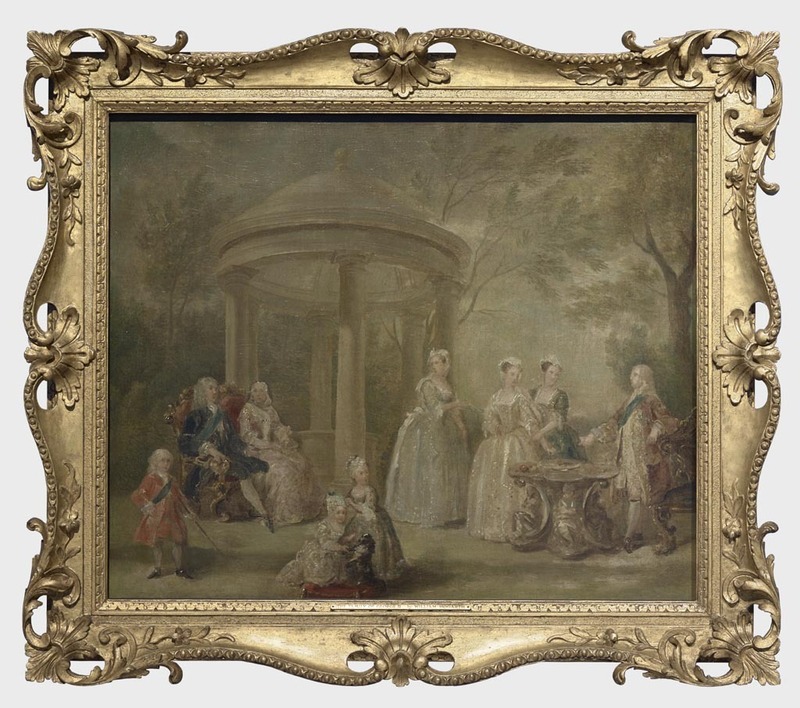 Hogarth then produced a smaller revision (National Gallery of Ireland), when the garden setting was disliked. This setting is the first distinctive aspect of Hogarth’s image: for this is a landscaped garden, of the type which Queen Caroline was creating at Richmond and Frederick, Prince of Wales at Carlton House. According to a contemporary account of the Carlton House garden, ‘this method of gardening is the more agreeable, as when finished, it has the appearance of beautiful nature, and without being told, one would imagine art had no part in the finishing’ (letter from Sir Thomas Robinson to the 3rd Earl of Carlisle, 23 December 1734). Such gardens were also intended to celebrate people and ideas: Queen Caroline’s Hermitage at Richmond Park contained busts of various British worthies. Here Hogarth depicts a temple flanking the enthroned royal couple, almost upstaging them (a fault corrected in the National Gallery of Ireland revision where their double bench-throne acquires a glorious baldachin above). 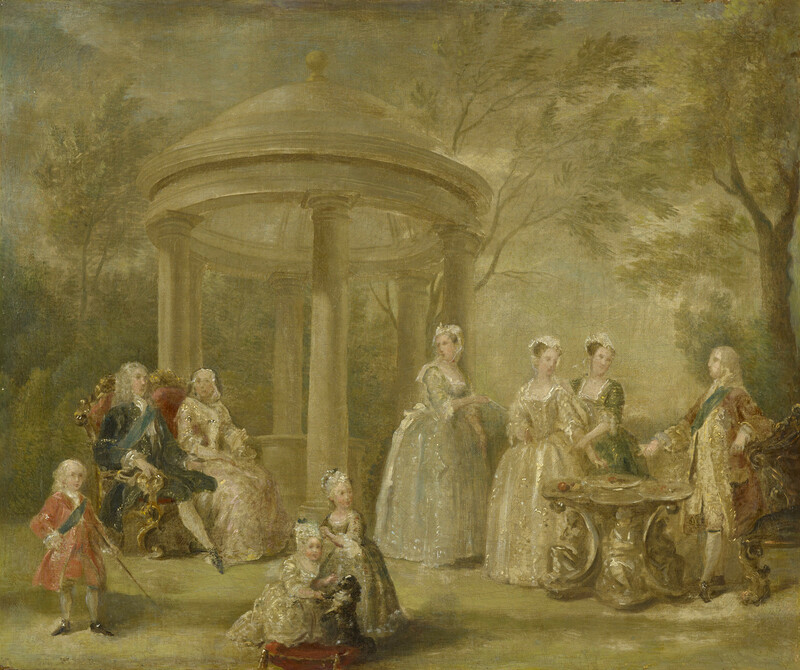 This composition should perhaps be read as depicting the reigning monarch and his consort on one side; his heir on the other (not yet sitting upon his slightly inferior armless throne), while in the centre a temple symbolises some concept — such as Liberty or The British Constitution — which trumps them all. Hogarth also introduces some interest with the subsidiary characters here: the two younger princesses teach a dog to shake hands; this is a common detail in Dutch painting and alludes to the ‘aptitude to learn’ of good children, especially girls. Frederick, Prince of Wales chats with the three eldest princesses, and seems to be offering fruit from a strange Baroque fountain-altar. This last episode looks like a retelling of the story of the Judgement of Paris and would perhaps have been made more effective and comprehensible in the finished work. This exhibition draws on oil paintings, works on paper, books, manuscripts and decorative arts from the Royal Collection to explore the way in which the garden inspired artists and craftsmen between 1500 and 1900.